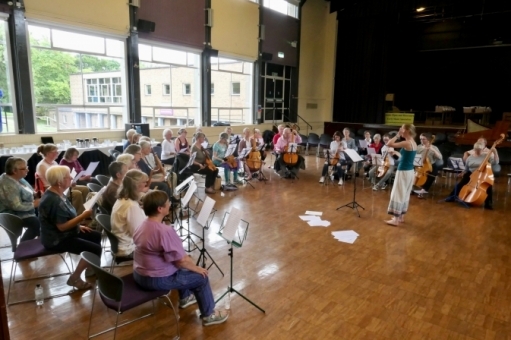 Renaissance Day at the NORVIS course expands each year to include challenging tasks for early musicians - this year, as well as the taught sessions and the voluntary ones, Andrew Fowler and Alison Kinder gathered a an ensemble 30+ players of recorders and viols with singers to play two three choir pieces, one to a part, by Hassler and Guerrero. 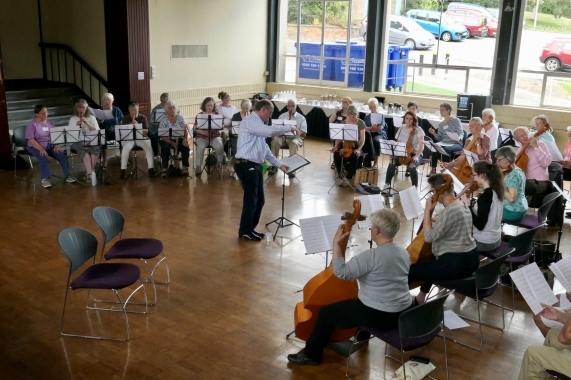 The ensemble used eight of Richard's instruments across two of the choirs. 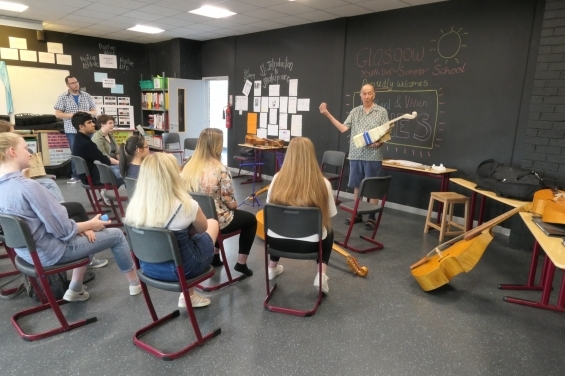 We took six viols to Martin Barnett's inspiring free 7-week summer school for new viol players - Richard described aspects of the making process to the participants, we played to them and they played to us and a good time was had by all. This is a valuable initiative offering a rare opportunity to youngsters. 2017 is the one year in two that we shall be at Blackheath Halls (in the First Floor Recital Room) and of course we shall welcome you for a chat and a play - viols, bows and music at all levels provided. 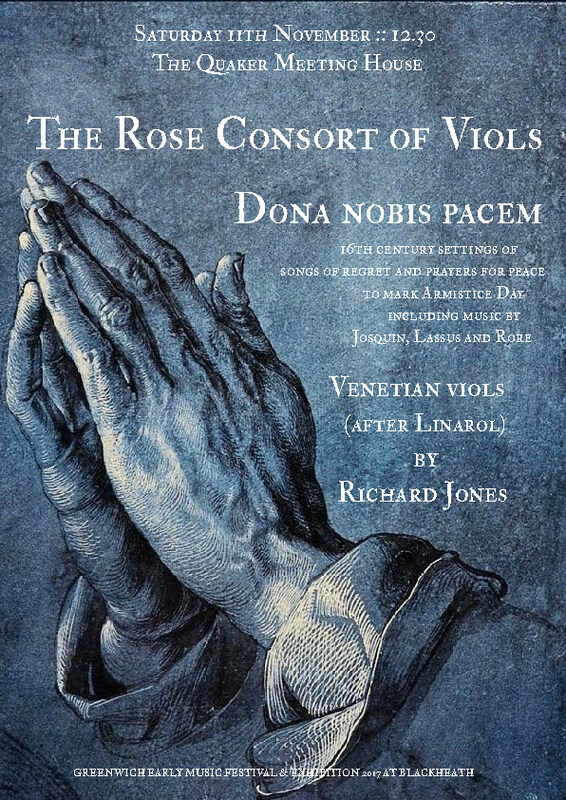 In addition to bows which you can buy, and my standard set of a;g;d;A viols, which you can play, I will be exhibiting two sizes of treble viol, all based on the Francesco Linarol instrument. 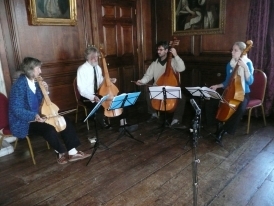 from a diary entry :: Three Days in York - during which The Rose Consort of Viols recorded a CD on Richard Jones' viols. Many of the viols I have made over the last five years have bodies made from a superb figured sycamore tree that grew near the Old Cement Works, near Dunbar in East Lothian, Scotland. 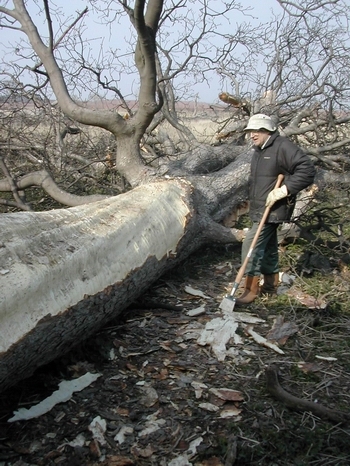 This is Ulrich Loening, my wood supplier, who travels all over Scotland in search of fine wood for musical instruments, standing by the Cement Works tree with a bark stripper. You can see the ripple in the trunk which gives the wild figures on the backs, necks, fingerboards and ribs of my instruments. 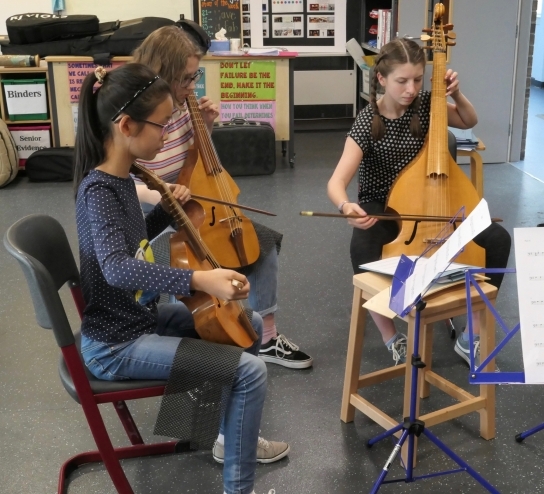 Our six viols go to early music courses at Durham. 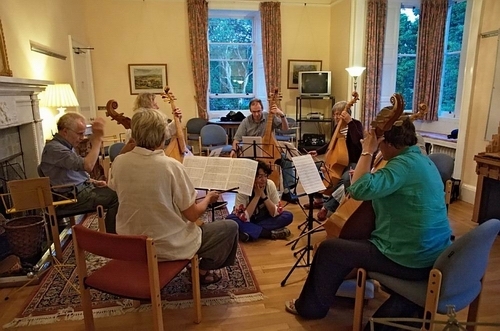 At Ambleside we have spent the afternoon playing with the very good singers who attend the course,after spending the morning coaching players new to renaissance viols. 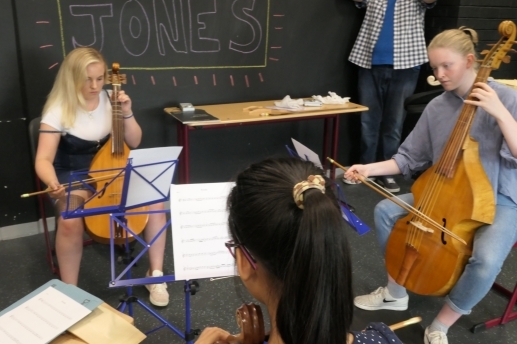 Sometimes these sessions seem too difficult, players trying a different instrument, sight-reading and making an ensemble can seem too much, but invariably, a sound comes and with it the smiles of pleasure that accompany accomplishment. 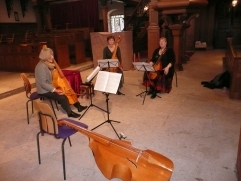 The afternoon repertoire was four-part French chansons which sound very sweet and sad with viols and voices. This may be our last Ambleside because the course is moving to The Wirral which is too far to travel in a day. 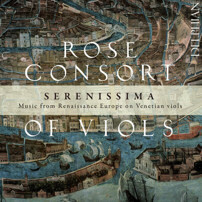 Several RJ viols have been to Venice, where Francesco Linarol lived and made instruments. Some of them travelled in seats on the aeroplane alongside the players. 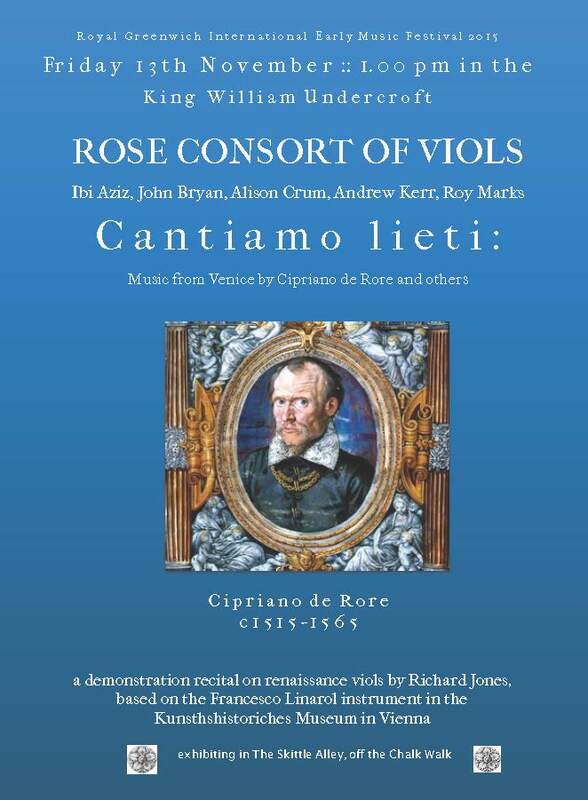 Richard Jones Renaissance Viols exhibit bi-annually at the London International Exhibition of Early Music at the Old Naval College, Greenwich. 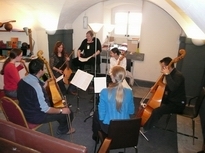 A 'music room' is set up in the basement Skittle Alley where viol players of all ages and abilities drop in to play in ad hoc groups throughout the three days of the exhibition. 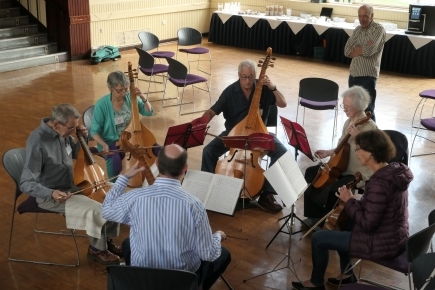 The weekend features demonstration recitals, master classes and concerts of early music as well as the exhibition of instruments.